A resolution commemorating the 150th anniversary of the Golden Spike celebration, marking the completion of the first transcontinental railroad, passed through Utah’s House Natural Resources, Agriculture and Environment Committee Friday by a unanimous vote. 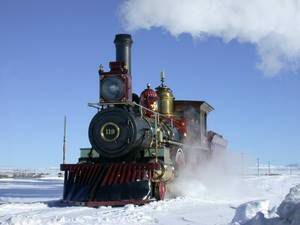 Locomotive #119 takes a demonstration run during the Golden Spike National Historic Site’s Annual Winter Steam Festival. The resolution, proposed by House District 1 Representative Joel Ferry, recognizes the historic significance of the railroad to the state and the nation. On May 10, 1869, at Promontory Summit, Utah, a ceremonial golden spike was driven into the final tie joining the Union Pacific Railroad and Central Pacific Railroad lines, marking the completion of the first transcontinental railroad across the nation. The resolution also recognizes the efforts of the people of Box Elder County and Utah, many of whom have dedicated countless hours to the Golden Spike National Historic Site. “A lot of people in my community, through volunteer service, have dedicated hundreds and hundreds of hours to make it a neat experience to go out and visit the golden spike,” said Ferry. The railroad runs through a number of small towns in Utah, including Corrine, which is where Rep. Ferry grew up. This past week, the United States Senate passed a package of public lands bills, which includes several proposals that would impact Utah. The bill, supported by Sen. Mitt Romney and opposed by Sen. Mike Lee, would among other things, elevate the status of the Golden Spike Historical Site to a historical park. The construction of the first transcontinental railroad involved 15,000 workers and took almost six years to complete. Chinese, Irish, and other immigrant laborers were responsible for much of the labor necessary to complete the railroad. Pioneer settlers from the Church of Jesus Christ of Latter-day Saints in Utah provided significant labor and capital toward the construction of the transcontinental railroad, including much of the grading work to complete both the Central Pacific and Union Pacific lines through Utah. Celebrations are planned for the 150th anniversary beginning on May 10, 2019 at Promontory Summit.